Ahhhhhh! Finally. I'm leaving tomorrow to go back to school. I couldn't be more excited. It's been a very wonderful, yet very long summer. I'm probably the only kid around to complain about not having school. Nerdy as it may sound, I'm ready. Ready for new Moleskine notebooks. Ready for new pencils. Ready for fresh Latin textbooks. I know what you're thinking. But Latin is actually really fun. I swear! One of the things I liked best about being in school when I was younger was lunchtime. Surprise, surprise. I couldn't wait to see what my mom had packed that day. I was lucky enough to have interesting and varied lunches. No peanut butter and jelly sandwich and an apple every day for me. Sometimes I had sushi. Other times, it was a thermos full of chili. On special occasions I would get a pita pocket filled with curried chicken salad. Homemade bran muffins, chocolate-dipped biscotti, and peppermint ice cream all made appearances in the dessert course of my lunchbox. While most of the things in my lunch varied from day to day, there was almost always a little snack bag filled with goldfish. At some time around 10th grade, my mom decided to stop buying the cheddar goldfish, instead bringing home the plain ones. They just didn't do it for me. They weren't goldfish. They were whitefish. And since that fateful day, I'm not sure that I've actually had 'real' goldfish. Blasphemy, right? So that's why I decided it was about high time I made some from scratch. And that way I could make them healthier. Well, at least I could convince myself they were healthier. These crackers can be made into any shape, though I chose leaves, acorns, and apples in honor of my favorite season. They are wonderfully cheesy, and the whole wheat pastry flour makes them just the tiniest bit nutty. 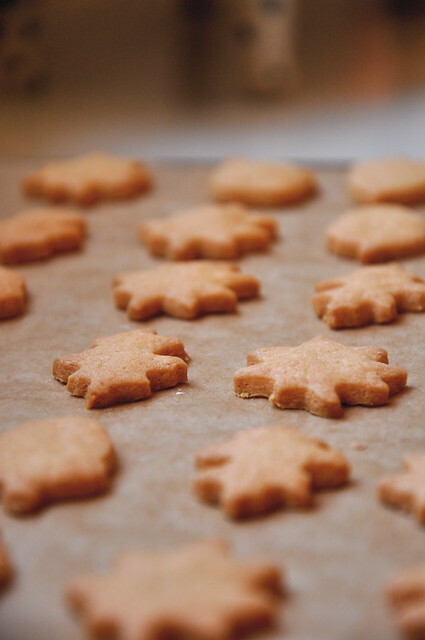 If you do decide to make them, be warned- once you start eating them, you won't be able to stop. Preheat oven to 350. Line two baking sheets with parchment paper. Place cheese, butter, flour, onion powder, and salt in the bowl of a food processor. Pulse until dough comes together in a ball, about two minutes. On a lightly-floured surface, roll dough out to about 1/8-inch thick. 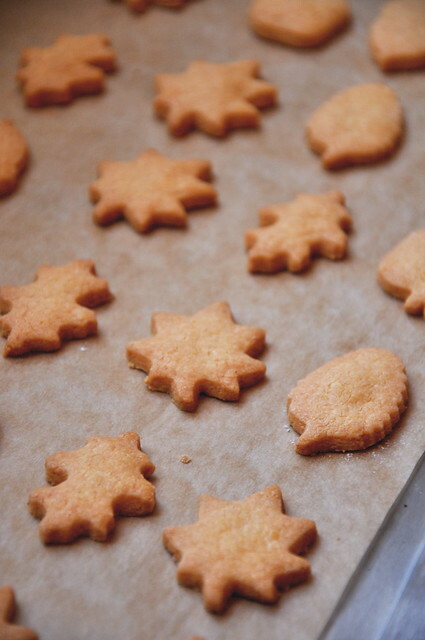 Cut into desired shapes, dipping the cookie cutter into flour between each use to achieve a clean cut. 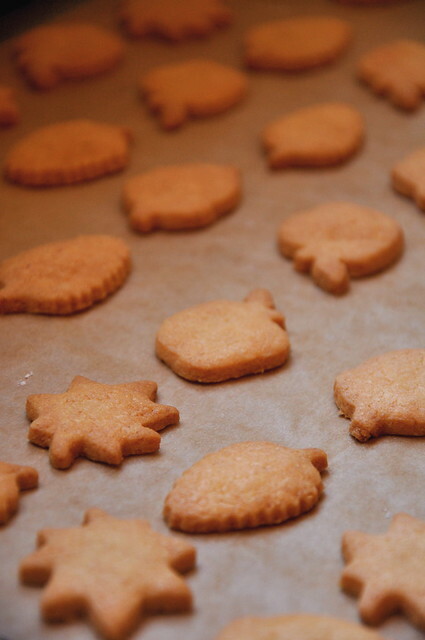 Transfer crackers to prepared baking sheets. Bake for 15 minutes, rotating halfway through, until firm to the touch and lightly golden at the edges. Cool on a wire rack.